Business phone systems for startups. Launching a startup and growing a business from the ground up is exciting and challenging. There are a lot of things to plan and create when running a startup, so the last thing you want to be worried about is phone service. Startups need an office phone system that’s all-inclusive, mobile and flexible. Startups are also often working within tight budgets, so it’s important to get all of the features you need to run your business communications effectively at a price you can afford. What do startups need in a business phone service? While startups usually start out small, they still need all of the phone features you’d expect at a big business or enterprise. Employees are often taking on multiple roles during the beginning days of a startup, and everything moves at a fast pace: you need a business phone service that can keep up. It’s also crucial to look polished and poised in the early days of a business. While having your employees use their personal cell phones to take office calls might seem convenient, it lacks professionalism. A main office number can allow you to look like an established business, and it can help you more easily route calls to the appropriate person. Features like extension dialing, conference bridge, ring groups and call logs can also give your employees the tools they need to communicate with ease. And, lastly, a mobile app that provides seamless mobile integration is an absolute must for busy employees on-the-go. Entrepreneurs also often work with a distributed workforce, remote workers, or offices in multiple locations. Using a mobile app that connects to your main business line could help you better manage your employees and communicate with partners no matter where they are located. Find out how this healthcare company got the business communications solutions it needed from Ooma while also supporting long-term growth goals. Ooma Office has given us exactly the phone experience our company needs, and it supports our long-term goals for growth. See how Ooma Office helped this small business centralize their phone system and provide a better quality of life for employees. A small company cant be held back because its phone system is unprofessional. Ooma Office gives a polished and consistent impression to our customers, while fitting into the work style of our organization. Mobile access: If you’re working in a startup atmosphere, you’re likely taking on several roles and will be on-the-go constantly. Having access to your main business line and your co-workers’ extensions through your smartphone will be big requirement. Easy DIY setup: As a startup, you’re probably starting with a small team and don’t need a lengthy, expensive phone installation. 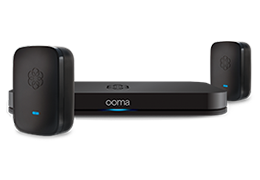 With Ooma, you can have your business phone system up and running in minutes. We also have several wirefree options for a clutter-free office. Virtual receptionist: In the early days of your startup, you likely won’t have a receptionist or assistant to help route calls. With a virtual assistant, you can provide your customers basic information about location and services, and route calls to the appropriate person. All-inclusive price: Every Ooma account comes with enterprise-grade phone features like extension dialing, call park, ring groups and call logs, among others. With Ooma, you get enterprise-grade features at a small business cost. To find out more about how Ooma Office can help streamline business communications at your startup, check out our main office page to get an extended look at our features, pricing and benefits. Watch the video below to see how Ooma Office helped a digital media agency create a more dynamic business communications system.